It was the first snowfall of the season, and with it came the awe and inspiration of… a hockeyBot! Yesterday wasn’t the best day weather-wise, but we still had a number of eager students show up to get started on our pre-season build project. For the past few years, we have spent 5-6 meetings covering safety, tool use, and building basic mechanical and electrical skills. Last week, we went over the general safety rules for our shop, hand tools, and the rules for using our bandsaws and drill presses. Students then wrote a safety quiz. Much like their driver’s license, the written test required an 80% to pass – however, it could be taken multiple times if needed. Our projects are designed to be completed in groups (of 4 this year), and give students a chance to demonstrate competence on each of the tools that they have completed safety tests on. We have previously made mini-dragsters and phone holders. 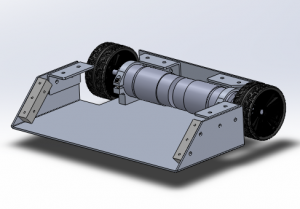 This year, we are taking on a battle-bot inspired design that our students will be able to push some game pieces around with and score goals. Each student in the group gets to make at least one cut, and drill a couple holes. They will then use our box and pan brake to bend the steel frame into the appropriate shape. From there, the electrical components are mounted, and the final assembly will take place. These little bots are fast – the motors we are using were spec’d for our mini-dragster project. They will be controlled with an R/C receiver and controller. So far, it seems like the kids are having fun with it and we are hopeful that it will pay dividends in the upcoming season.